White Flight | Movies | Style Weekly - Richmond, VA local news, arts, and events. "Snow White and the Huntsman" is gorgeous technological fruit mixed with action-adventure tropes. "Prince Charming better get here soon or my lips are going to freeze off." In yet another Hollywood fairy tale remake, Kristen Stewart plays a girl named Snow. Who's the fairest of them all? Certainly "Snow White and the Huntsman" would like to be. I'm fairly sure Oscar nominations for visual effects, sound and costumes are in its future, and I have no magic mirror. The rest of it's a mixed bag of apples, some delicious and some threatening indigestion or worse. Charlize Theron crazily overacts as the evil Queen Ravenna, and the young princess she's after, Kristen Stewart, should be thankful to spend most of the film either locked up in a tower or on the run. Her Snow White brings entire ecosystems back to life, a stretch for any actress, and thankfully for Stewart's sake this two-hour bedtime story comes with the best illustrations that Hollywood money can buy. Like 2012's other "Snow White" adaptation, "Mirror Mirror," with Julia Roberts as the Evil Queen, this one offers arresting visuals as its main attraction. But these aren't lovely but grim, as in the Brothers often credited with the most well-known version of the tale. Theron's Queen, dressed literally in raven black, plucks raw hearts from songbirds like succulent canned cherries, and stays young by sucking the life force out of the mouths of local virgins, a trick she might have learned from "The Dark Crystal." When she finds out that Snow White, with her unsurpassed beauty and innocent blood, is the only real threat to her power, and that her heart will give her perfect and everlasting youth — well, luckily for Snow White, this is the part of the movie where she escapes. Filled with forests dark and maidens fair, all of the above proceeds with the rapid pace of a storybook. One suspects the intention — be it that of director Rupert Sanders, his three credited screenwriters or the many hands in this bubbling brew — is to return "Snow White" to its roots, with concessions to the needs of contemporary audiences. This is a delicate balance not always achieved, with "Snow White" veering sometimes uncomfortably between dark fairy tale and rousing mainstream action-adventure movie. The best aspect is the contrast between Queen Ravenna, whose blackened soul blights the land, and Snow White, who communes with nature and is its potential savior. There are many influences evident in Sanders' film, but the idea of the land and the Queen being one is particularly reminiscent of John Boorman's "Excalibur" (1981). The costumes, by the frequently Oscared Colleen Atwood, also recall that memorable film, especially their animalistic character. But there also are scenes in which Snow White's mere presence, Grail-like, restores the land in a manner similar to Boorman's film. It's tempting to criticize the casting of Stewart, a tomboyish Snow White, as a ploy to lure her legion of swooning tween "Twilight" fans, but the film obviously intends her to update the role with traits of vulnerability and strength. 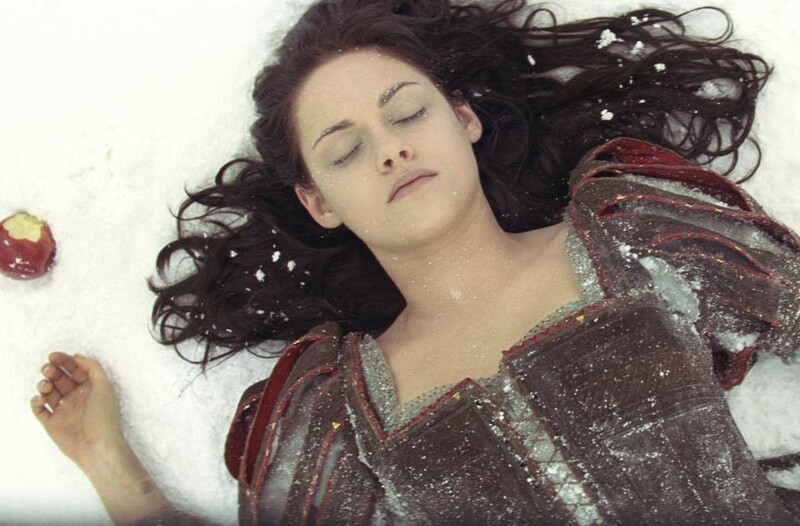 Stewart's Snow White seems less a damsel in distress than in awe of her destiny. Eventually she gives a "Braveheart" speech and leads a cavalry charge across a formidable moat. It sort of works, and sort of doesn't. Stewart lacks the acting ability to carry a film by herself, but "Snow White" keeps busy with so many side plots and chase sequences you don't have time to worry about it. The movie is by no means difficult to sit through, but it takes on more weight as it goes along and becomes by turns overstuffed and oversimplified. There are two love interests (Chris Hemsworth plays the Huntsman, but we get a prince, too), a side-plot counterinsurgency against the Queen and an obligatory band of computer- and one-liner-enhanced dwarves. All are given handsome visual detail but shortchanged in emotional complexity. This is a movie constantly stopping to preen in the mirror. Maybe the most telling example is the Queen's mirror itself. It's impressive enough as a VW-sized gold disc, and then overdoes it by throwing up a golden blob of a monk, all sonorous-toned and serious, like the shiny young nephew of Darth Vader.